Whether in the nursery, the living room, or the kids' room, a pint-sized rocking chair brings year after year of joy to its miniature owners. This Fiddleback solid wood rocking chair - handcrafted to order in an Amish woodshop in the northern United States - brings the best of American woodworking to its classical design, tracing its time-honored heritage back through every hand-sanded surface and hand-turned slat. In taking a traditional design and scaling it down to a perfectly proportioned kids' chair, the Fiddleback succeeds in bringing both the traditional beauty and famous durability of Amish woodworking to its solid wood frame. 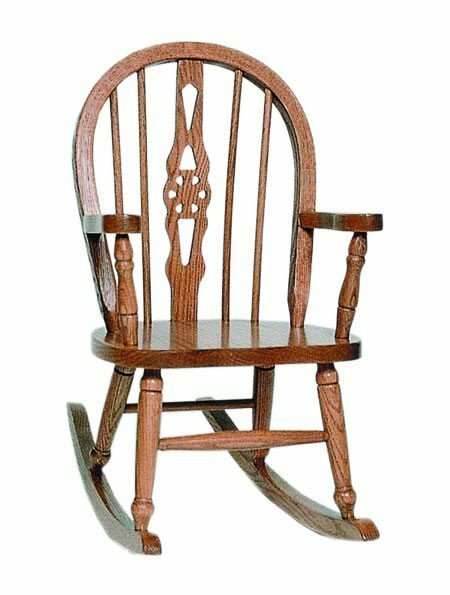 No matter how many generations of kids, grandkids, and great-grandkids take this rocking chair as their favorite spot in the home, the Fiddleback's handcrafted construction and quality American materials will keep it looking and feeling as strong and beautiful as the day it was built for as long as the family needs it. Your Fiddleback will be built to order with your choice of wood and finish package. Simply select your perfect combination from the menus above, and if you run into any questions at all, please don't hesitate to get in touch with us by phone or by email - we love the flawless traditionalism of this beautiful piece, and we would love to talk with you about the joy it brings to the home. This rocking chair can be shipped to any location in the United States for a flat rate of $50.